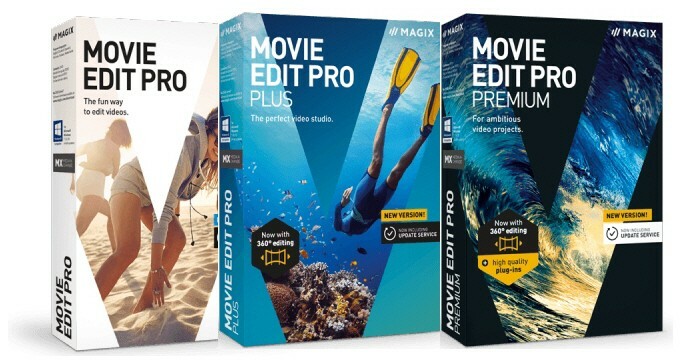 Magix Movie Edit Pro is the European based software company’s feature rich video editing software program aimed at the consumer through to semi-pro video editing market. Unfortunately this early drive towards innovation rather than stability resulted in a product that although packed with awesome features, quickly gained a reputation for being unstable. Sometime back around 2011 it seems that Magix realized this constant drive towards more and more features without underlying stability was hurting them badly. It was at that point that they stopped mindlessly adding new “half-baked” features and embarked on a strategy of making the software usable and stable for the average person. It was also around this time that I began adding a Magix Movie Edit Pro review to my list of personal recommendations for a consumer level video editing software solution. Since then Magix haven’t really skipped a beat with the ongoing development of Movie Edit Pro and although they have continued to add new features they have maintained a solid record for keeping the program stable and easy to use. For the last two or three years they have also invested a good deal of time and effort into improving and developing their help systems, tutorial knowledgebase and user forums. The result of all of this is a complete end-to-end video editing software package that is easy to use, stable, feature rich and backed up with a solid online presence. As a European company they have always enjoyed considerable success so, for many years now Magix Movie Edit Pro has been that great editor that no-one had ever really heard of! 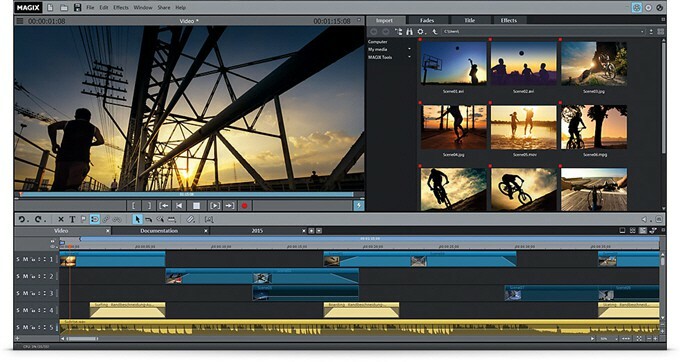 Although Magix Movie Edit Pro can certainly hold its own against its competitors in this class with regards to general editing features, their focus last year on the rapidly expanding action video has certainly given them an edge. The software is packed with features aimed at making GoPro or Action Cam style footage easier to handle. This year’s release has focussed on only a few major additions whilst improving the existing ones. Check out the video below to get a feel for this latest version. Probably the first new feature that we need to get out of the way is how Magix will be developing the software into the future. They have completely dropped the concept of re-releasing the software annually under a new version number or as they have in the past, by using the year. In light of that, last year’s Movie Edit Pro 2016 is now and into the future just simply Movie Edit Pro. What this actually means is that the software will continue to move forward on its development path on a constant basis rather than re-release every year. The new pricing of the program includes full updates for an entire year meaning that no matter if there is a minor fix or even a major overhaul you are covered for that initial year. At the end of the year you will still receive all critical updates for free for as long as you are using the software. If you notice a major update (not a critical operational one) that makes you want to get the latest version you can then just pay for the annual update service and you will be covered for another year. As far as value goes this is comparable to most other video editing software products around today. Movie Edit Pro always had a “pretty good” video stabilization module included within the software but like most of these “in-house” stabilizers there was a limit to just how much you could do with them. Nearly all the current software makers (and now Magix) have abandoned the development of their own software for this purpose for a few good reasons. First of all the evolution of high definition files and the compression they use has made this kind of program very difficult to maintain let alone improve. All it takes is a new set of video file parameters or a change in a codec and the module pretty well has to be rewritten from scratch. Secondly, there are dedicated software makers out there who because that’s all they do, do it so much better. proDAD is one of those companies and Mercalli V2 is one of their dedicated stabilization modules. This is now included across the board in all versions of Movie Edit Pro. This is another new feature applied to all versions of the software and allows for the user to add and use open source third party plugins. What this really means is that an enormous range of free and paid plugins designed for all aspects of editing and effects can be simply imported into the program and used seamlessly. Only available for the Plus and Premium versions this one has finally been taken through to a finished product. Last year they introduced it as a feature but really it only offered the ability to import 360° footage, choose a section of it from one angle then incorporate it into a regular project which of course could only be rendered to a regular file. This year they have completed that feature so that you can import 360° footage, edit it and then output to a 360° degree file ready for upload to YouTube or some other service that will display 360° footage correctly. Magix always had some pretty good color correction and grading tools on offer and this was largely due to these features trickling down from their pro editor, Video Pro X. This year in the Plus and Premium versions they have added a very cool feature that is highly applicable to today’s video shooting environment. It is likely these days that anyone shooting a particular event will be using auto settings on the device they have. Similarly it is also likely that anyone editing footage will have access to other footage from other devices that were present at the time. The key difficulty in using all this footage is that the difference in devices and the auto settings will usually result in wildly mismatched footage. Different footage will have different white balances, color saturations, hues, and temperature which can be very distracting to the viewer. Trying to match all this footage manually using the color tools so that it looks like it was at least shot at the same time is like sticking a chop stick into your eye. You can do it, but once you have started it quickly becomes apparent that you really don’t want to do it! This new module while not perfect, can get you very close to a perfectly matched set of shots with one click. In the Plus version of Movie Edit Pro they have introduced a simple but effective tool to map out a travel route for those “holiday” or “where we went on a trip” kind of videos. In the Premium version you get the full deal with the Vasco da Gama 9 travel route animation software that includes a GPS database with approximately 80,000 animated cities, towns and villages. It has about 300 templates in the 3D object library that you can use to present your travel route in detail and in up to 4K resolution. Each time you open the Magix application a dialogue box appears first offering beginning choices for what you wish to do. You can start a new project and set the preferences for that project at the same time, open an existing project or select a movie template for using the “easy mode” wizard system. If you like you can select to skip this dialogue box the next time you open the software up and just have it open into the mode your always use. The layout as shown below is pretty straightforward with Tabs at the top of the screen covering each stage of the production process from Import though to Share. If you can’t understand how to use a particular feature or function, you can go to the very serviceable help menu to troubleshoot ir get quick answers. The Magix website has been undergoing constant updates for the past year with the addition of a number of great “How to” videos providing you with answers to a wide range of questions covering basic through to advanced use of their software. On top of that they have an excellent user-to-user forum with plenty of people there willing to offer tips, advice and help for anyone needing it. As far as the user interface goes it is no better or worse than anything else in its class. Like most fully featured video editors there is a lot of functionality here to accomodate, so you will have to spend a little time to find your feet if this is your first time using the software. The software can handle just about any type of video you are likely to throw at it including all the latest highly compressed high definition video file types such as AVCHD up to 4K Ultra HD. More importantly it borrows functionality from its big brother Video Pro X and can work natively with many of the more exotic formats in their original format. This eliminates the need for the software to convert them to a more “editing friendly” form first. This applies to both 2D and 3D footage. You can import footage from all common (and not so common) storage devices and systems. Some of the popular recording devices that you can import from are Blu-rays, DVDs, all kinds of camcorders, a range of handheld devices as well as cameras that can capture HD video footage. The program can output to a wide variety of video types ensuring compatibility with most devices such as the many Smartphone brands, the iPod Touch and most other mobile devices. You can create CDs, DVDs and Blu-rays and from within the software, directly upload your finished video to YouTube and various other video sharing sites. It has an excellent range of preset parameter choices depending on your playback requirements and you can also manually set the parameters of any file you create. Modern video files achieve high quality within a relatively small size by using very sophisticated compression technology. The word “compression” is used because it sounds a whole lot better than what is actually happening! What the software in your recording device (firmware) is really doing is throwing stuff away! It can do this because it makes a record of what was thrown away so your computer can re-create it when you are editing or playing it back. This in turn throws enormous stress on to your computer resources and is the usual cause of freezing, crashing and other undesirable behavior whilst editing. To avoid this scenario, in Movie Edit Pro 2016 you can have the program automatically or manually, create a set of small low resolution copies of your original files. Using these “proxy” files you can happily work away on your project without worrying about freezes and crashes on your computer. When you have reached your final decision regarding your project and it is time to create the final product, the program uses the original high resolution assets to do so. In addition to 4K Ultra HD video compatibility Movie Edit Pro 2016 can also handle XAVCS files at that resolution. Since the last version of Movie Edit Pro the program has been re-engineered for 64 bit systems and with that came significant improvements in performance. The program runs just fine on 32 bit systems but because of the limitations of that file system it does miss out on the full power available. With 64 bit architecture the program can easily pull in processing power from the GPU (Graphics Processing Unit) as well as make use of any extra RAM loaded on to the computer. This is especially important for anyone wanting to try their hand at 3D projects. This all combines together to make real time previewing a very smooth experience especially when using transitions in clips where the software needs to process “on the fly” to show the results of your editing choices. All 3D and HD transitions are now fully calculated using your graphics processor to run smoothly during previews. In the same way the GPU has been roped in to do some of the dirty work for the transitions it has also been called to duty for video effects resulting in faster performance all round and better previewing. Suddenly my Movie Edit Pro Plus editing program don’t have sound when I import .MTS files into the timeline. Previously I had no such problems. OK so telling you that this is rather unusual is not really helping… so I wont bother! There are a few possible reasons for this so let me know what you can. 1. Are the files you are using (.mts) unusual in any way? 2. Have you used the same type of files from the same source before with no trouble? 3. Have you recently installed any software on your computer that may use resources for video or audio editing or play back? Get back to me so we can continue to debug.